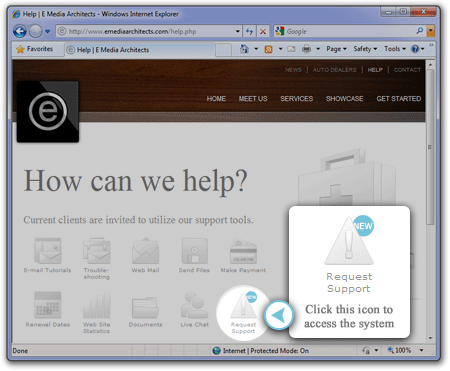 We are pleased to announce the launch of a new Support Request System exclusively for E Media Architects clients. This brand new, no-cost, online service affords a better way for you to obtain individualized technical support. Anyone who works within or provides technical services for your organization* — not only those staff members who are accustomed to dealing with us. The first time you submit a Support Request, it takes just 30 seconds to create a personal account which will enable your immediate access to the system in the future. We realize that if your issue pertains to E-mail, it may not be possible to use E-mail to request or receive help. So this Web-based system works entirely independent of E-mail, so you can get help fast – even if you don’t have access to your E-mail. Our new Support Request System gives you the same direct access, but without the usual time delays associated with E-mail, or even refreshing the Web page! Once you’ve typed your request, simply leave the Web page open. A notice will automatically appear on screen as soon as we’ve responded. Because we will no longer accept tech support requests made via phone or E-mail, all requests will be queued and responded to in chronological order. You also have the option of marking your request as Emergency priority. Organizing requests in this way means everyone receives attention in the most equitable order. Our new Support Request System utilizes powerful data encryption to keep sensitive information (like passwords) secure during transmission and storage. E-mail does not. Once an issue has been resolved, you may again face a similar issue in the future. If so, you will want to remind yourself of the solution. So instead of racking your brain or searching through old E-mails, just log in to the Support Request System where your individual history of requests and responses is privately stored for future reference. As in the past, we personally provide tech support, and so we can respond only during regular business hours. If you have an after-hours request, we will respond as soon as possible the following business day. Remember that detailed tutorials, troubleshooting, and common questions are already published in the self-serve Help topics on our Web site at www.emacreative.ca/help. So if you have an issue, start by checking if it is covered here. If not, feel free to create an individualized Support Request. Personalized tech support that’s fast, easy, reliable, secure, and organized — that’s how our new Support Request System can serve your needs. Effective immediately, we will be using this new tool exclusively to provide direct assistance, and so we will no longer be fielding support requests made via E-mail or phone. We’re excited to hear your feedback! Please leave a comment below or contact us directly. *System access using E-mail addresses outside of your domain will require pre-authorization from us.